The lot area is a tidy 4,500 square feet with applicable setbacks, leaving a buildable area of 2,843 square feet. 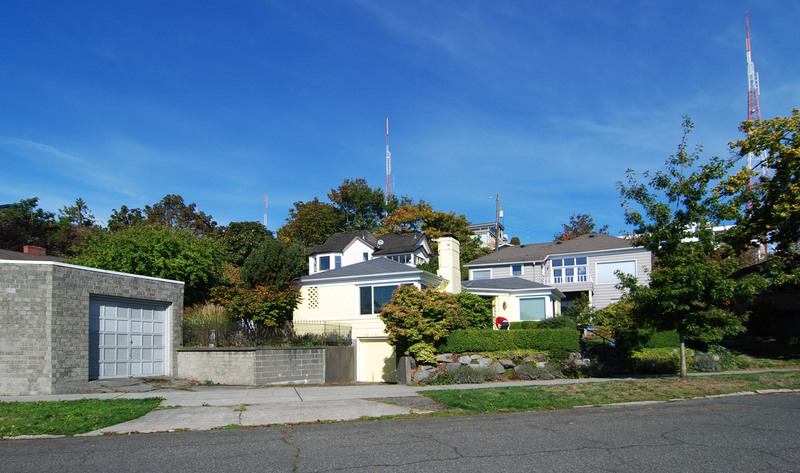 There were certain features inherited with the lot, such as the existing curb cut and retaining walls at the south end of the property. 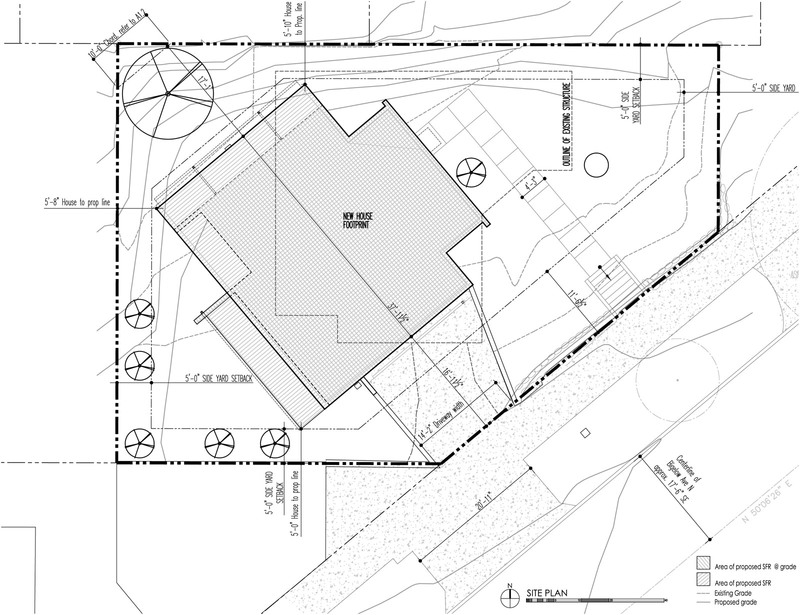 An existing and non-conforming concrete masonry unit garage on the adjacent parcel is also tight up to the property line and needed to be considered with the proposed design. Despite these limitations, it was clear that the site had the potential for extraordinary views that the design needed to optimize. 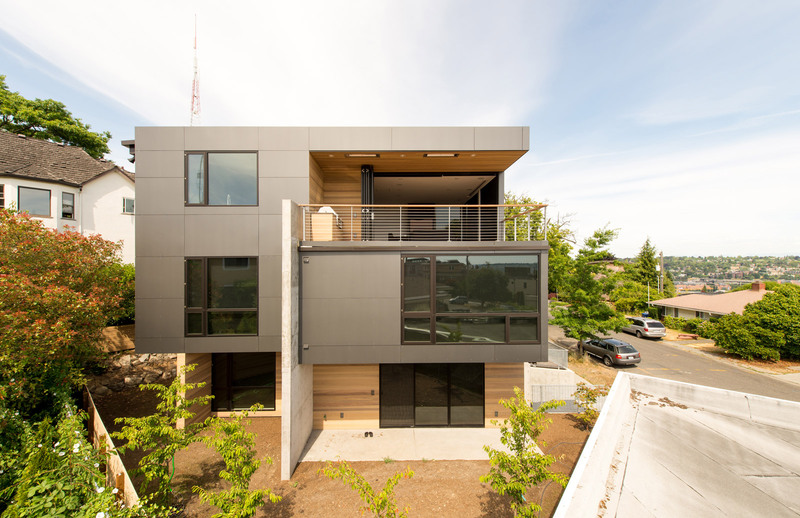 Storm water management has become an increasing concern in the Pacific Northwest and stringent building codes limit a proposed residence’s footprint to 1,500 square feet. The footprint of the new structure, along with the sidewalks and driveway is 1,778 square feet and while this is compact we still had an excess of 278 square feet to deal with. To mitigate this overage, we planted additional trees and used a permeable driveway surface, both of which limit the amount of storm water leaving the site without the need for expensive infiltration facilities. These methods maximized the amount of impervious surface area, while keeping the permitting process as simple as possible. Fitting the necessary functions into a tidy footprint of roughly 1,100 square feet necessitated a structure of four levels and, in many ways, became a game of Tetris (more on this below). Subsequently the 30’ height limit was an important factor in determining the massing of the house. It’s also worth noting that the median between the property and the street is managed by the Parks Department which required additional permits for use and temporary storage of materials. The interior functions include the typical common areas (living room, kitchen, dining room) along with two bedrooms, a master suite, a guest suite, a family room and an office space, in addition to the necessary bathrooms, utility spaces, garage, and circulation requirements. 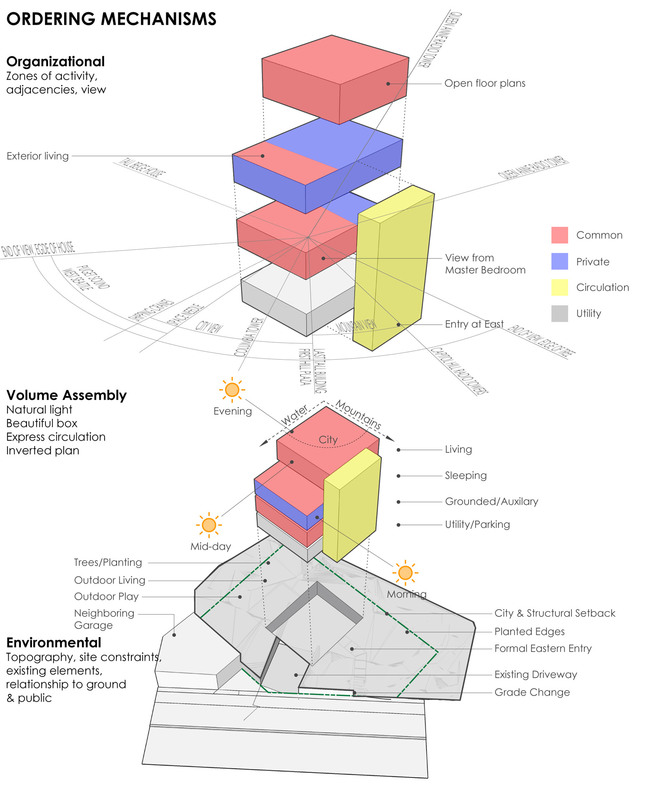 In order to achieve the desires relationships among these different spaces, and maximize the natural light and views, the massing exercise led to a tall, skinny form as illustrated in the study diagram below. Because the views of Seattle, the Puget Sound, the Cascade Mountains, and Mt. 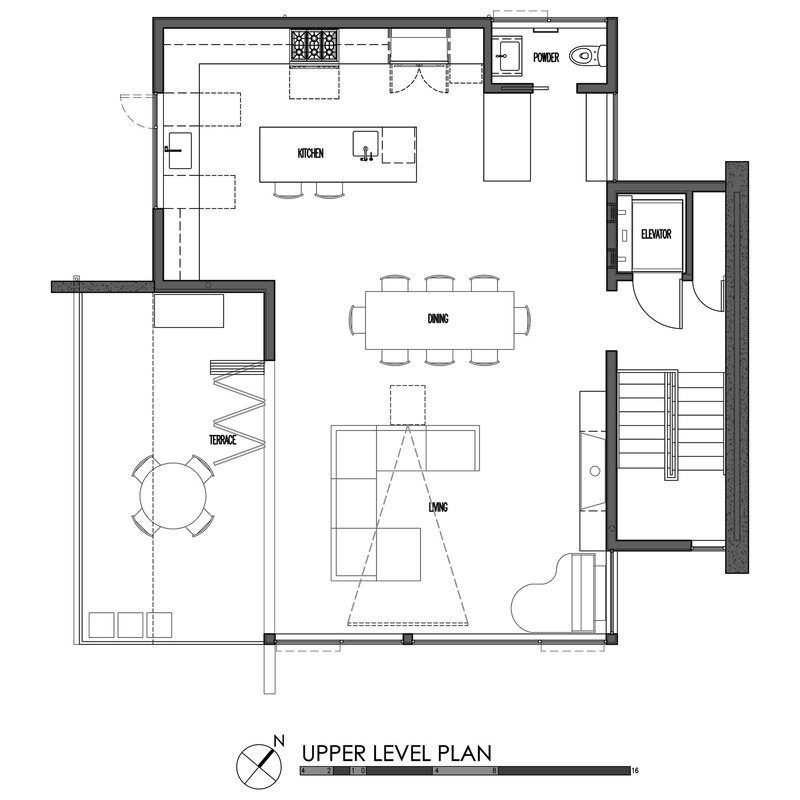 Rainier were important at the common areas, the design uses a reverse floor plan. The living, kitchen, and dining areas are organized on the top floor, while the bedrooms and more private areas of the house reside on the 2nd and 3rd floors with the basement and utility spaces below grade. In order to efficiently serve each of the four floors, a dedicated circulation core at the north contains all of the vertical circulation. 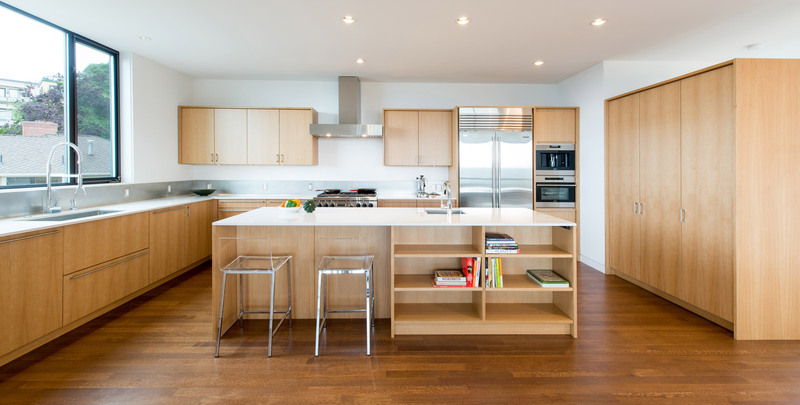 The biggest challenge of the reverse floor plan is reaching the kitchen from the garage with groceries, kids, and everything else included with the family of four lifestyle. A small residential elevator solves this issue by providing quick and easy access from the basement to the top floor. 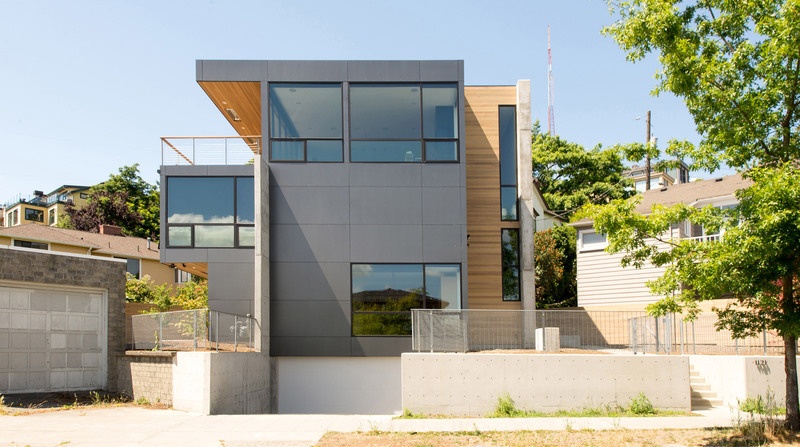 The stacked program of this residence is both unique and intricate, allowing the envelope to take significant design cues from the interior functions. In other words, the house looks like what it’s doing. Three primary materials are used at the envelope. 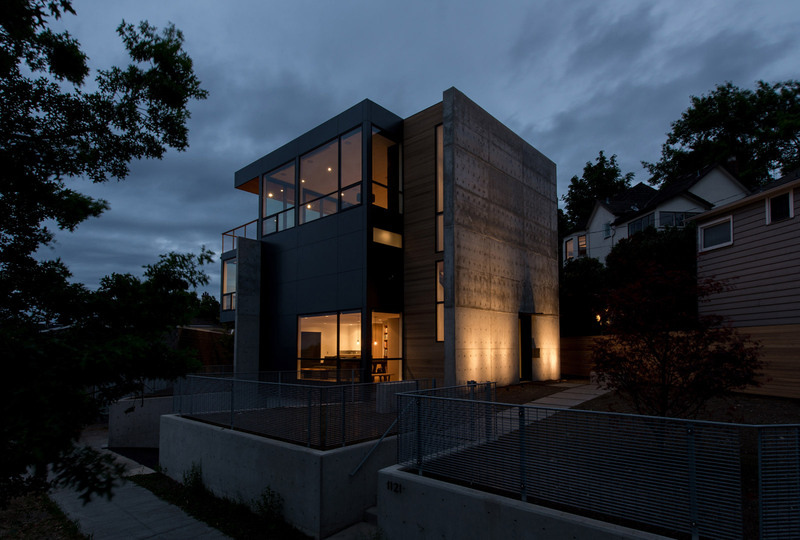 The solid masses are enhanced with aluminum rainscreen panels and the windows are bronze anodized aluminum. 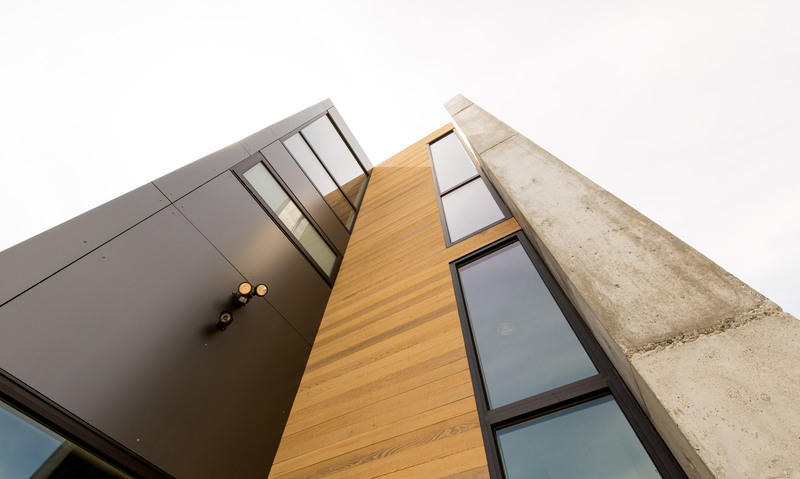 This darker tone allows the warm cedar to pop at the circulation core and the recesses below cantilevers. Prominent walls within the house were formed in concrete and extended beyond the envelope out into the landscaping. 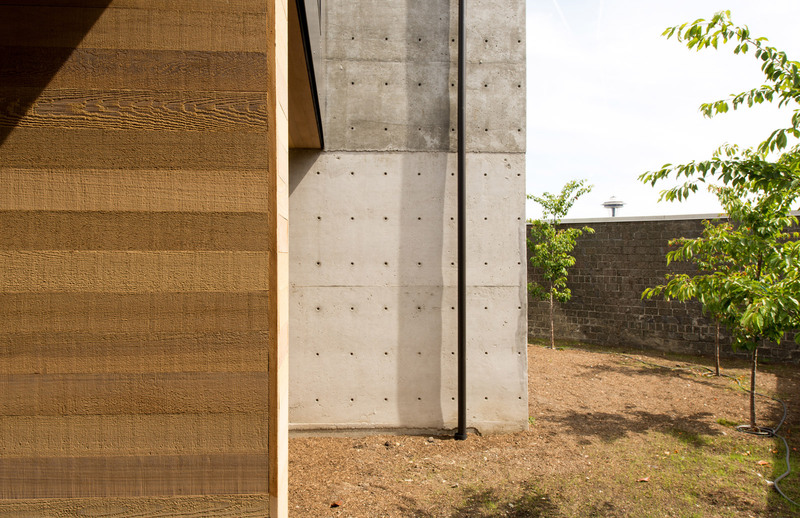 At the north elevation of the structure, a 30’ tall concrete wall bookends the structure, provides a dramatic entry point, and serves as a backdrop to the landscaping. 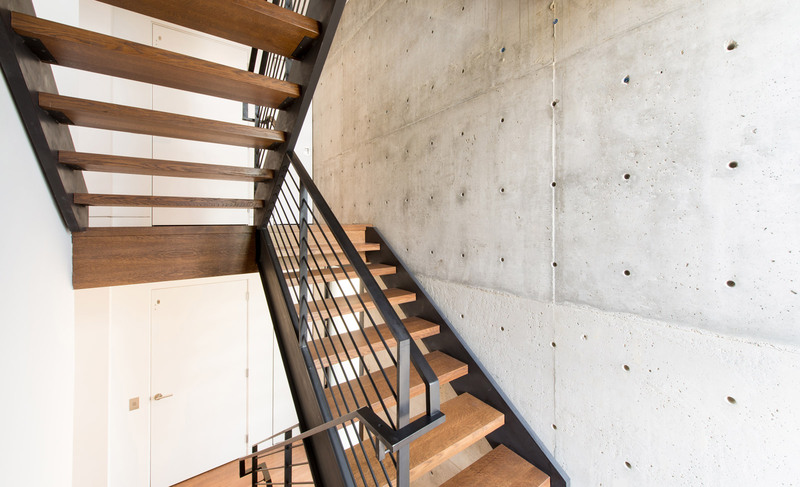 Inside, the concrete walls play an important role adding texture to the interior material palette and enhancing the connection to the exterior. 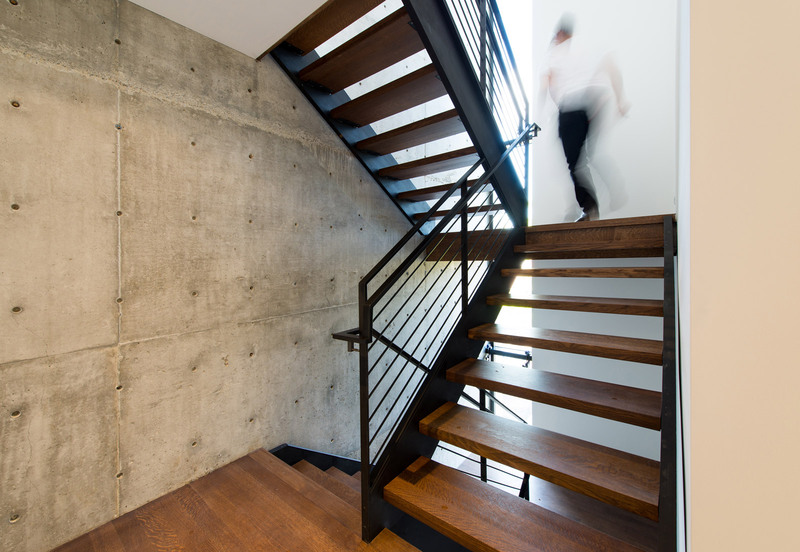 The stairway provides a peek to the view beyond via a vertical slot window. Stair climbing visitors are rewarded at the top as the common areas open up and provide stunning views of city, mountains, and sea. 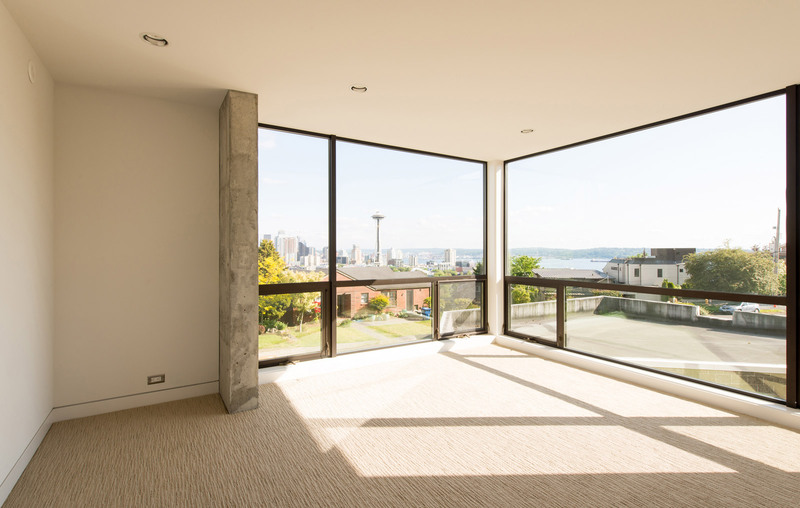 The cost of the home came in at $255 per square foot. For a detailed analysis of how this number is computed, we highly recommend taking a spin through our residential construction budget cheat-sheet. 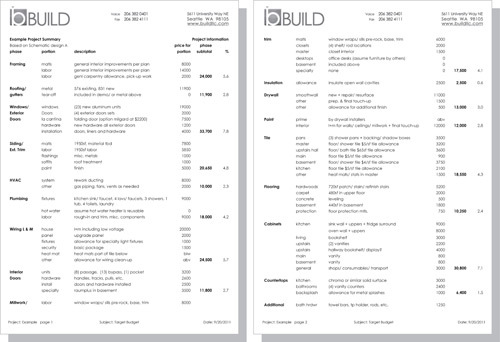 With the booming real estate market here in Seattle we estimate that the project has already established (or exceeded) its market value. From start to finish the construction took approximately 11 months. Rift and quartered white oak flooring with Swedish finish and gray stain by Olde English Hardwoods, Inc. Thanks for following the coverage on the Desai Residence. 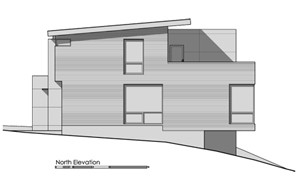 Stay tuned for additional posts on the details, specifications, and design strategies behind this project. Super Impressive. Thanks for publishing this. @ William -thanks for the compliment, glad you like. beautiful house and I’m impressed at the budget number you hit. 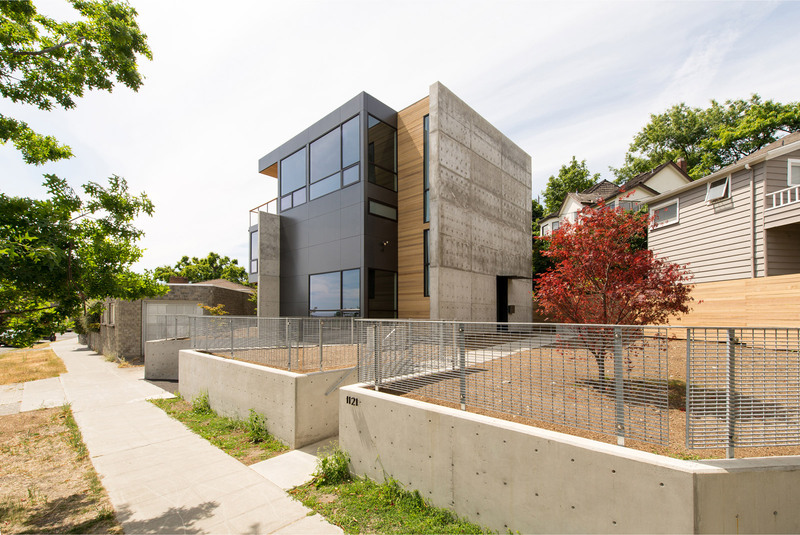 did you get any pushback from the neighbors about the 30′ tall concrete wall? I was also curious if you incorporate any insulation or thermal breaks into your concrete, particularly with those interior/exterior conditions? 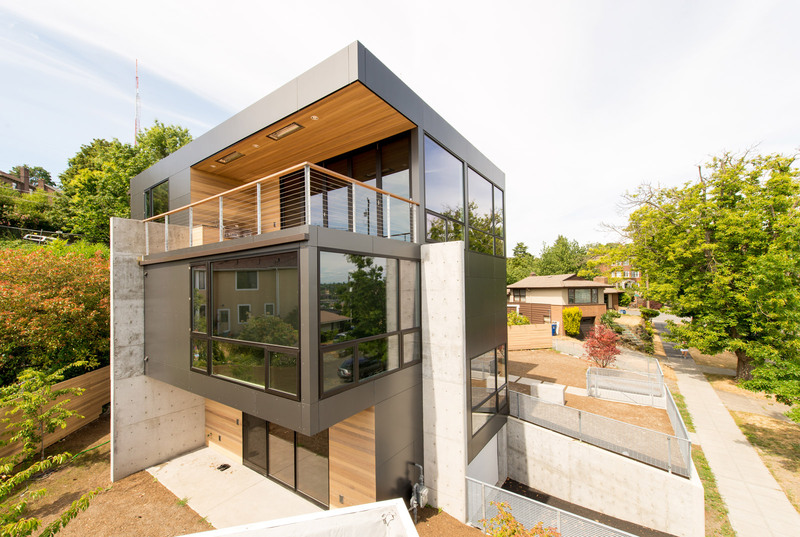 @ Eric -The large concrete wall is actually made of two 6″ thick concrete walls sandwiching a layer of rigid insulation to meet the energy code. The other concrete fin walls include thermal breaks. Opinions in the neighborhood have been mixed regarding the concrete walls but there wasn’t any pushback. Wonderful work and write up. Living in Washington DC, and paying the per sq. foot pricing we do (we’re working on split level reno where the pre purchase price was a bargain at $311 sq. ft.), and knowing that work like this can be done for that price point is exciting. Keep up the great work and sharing through your blog. I want to go ahead and say I love all of your articles. I don’t have any background in architecture but I’m very interested and read all I can about it. I subscribe to your blog and appreciate the work you guys do so, thank you. My question is kind of off topic though. I enjoy woodworking and wanted to know if you might know where, what I’m guessing is, their dining table is sourced from? i am impressed by how well thought out this is; the reverse floor plan is a very interesting idea and i can see the logic in it. i can imagine that it would be particularly appealing to people who want to use their houses for entertaining. another good thing about having the kitchen upstairs is that it might create a slight deterrent to excessive snacking (and the attendant weight gain). but i’m curious as to how people reacted when they saw that visitors would have to walk up a couple of flights of stairs to get to the common areas? it reminds me of living in an apartment. 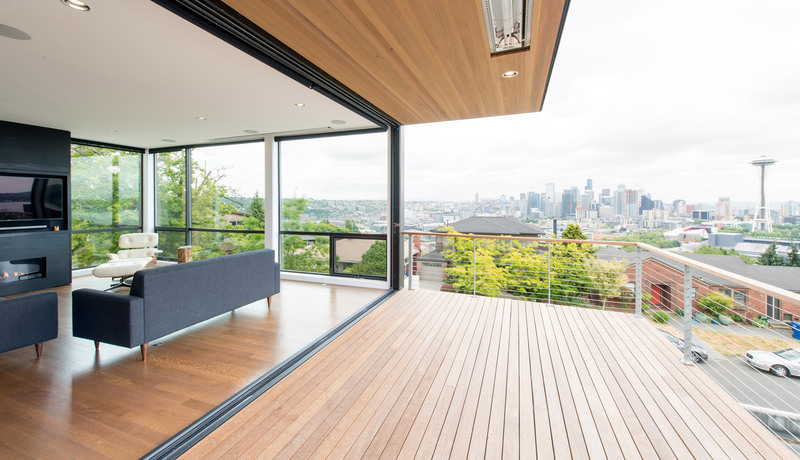 i like the idea of having hardwood flooring and like-appearing wood in the exterior deck; it reinforces the idea of seamless integration of interior and exterior. one thing turned me off was the concrete, it strikes of brutalism. it seems to me that you’ve got to have a particular kind of client who would want that kind of stuff. i assume that you did something to insulate the concrete to prevent thermal losses and moisture intrusion. Drooling over the La Cantina window/doors…..nicely done Build! Very impressive! 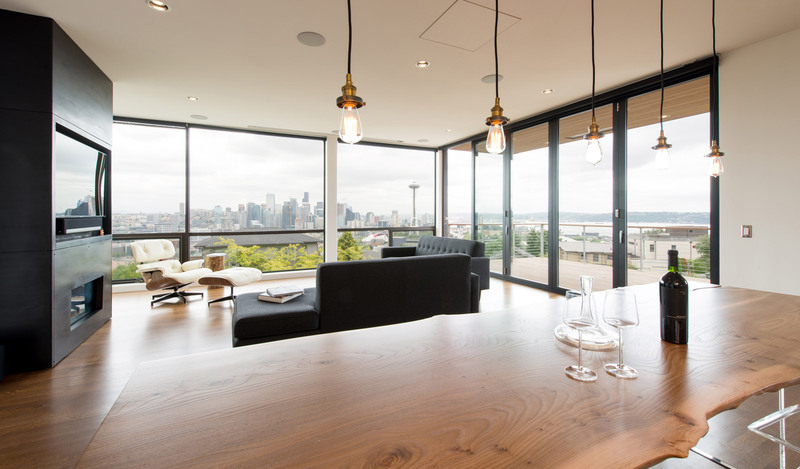 Nice use of the reverse floor plan to capture the best views. What did you use for the exterior railing around the front yard? And, do you have a general budget number you can use for it ($/SF)? We’re looking for a nice looking product but that also doesn’t break the bank like some railings can easily do.